This was a lesson in how things rarely work out how I imagine... when we knew we'd be moving to Hong Kong, I made Michael promise me that we'd make a trip to Beijing to climb the Great Wall of China. I had this vision of a gorgeous Christmas card featuring our family on the Wall that would be worthy of framing! 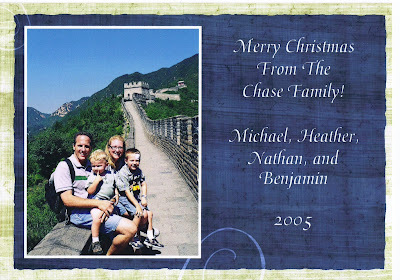 Of course, we barely made it to Beijing at all as Michael's work schedule never allowed any time off for a family trip. Right before we moved back to the U.S. we did get the chance and we quickly took it. The day before we were to climb the Wall, Nathan had an accident in a silk factory and got an enormous gash in his forehead, requiring us to take a trip to the ER in Beijing so he could get stitches. They put a huge white bandage on him and sent us on our way. Of course, that meant the Christmas card photo I'd been planning for two years would have the huge white bandage prominently featured... I did eventually get over it as it shows Nathan as he really is- very active and prone to accidents!